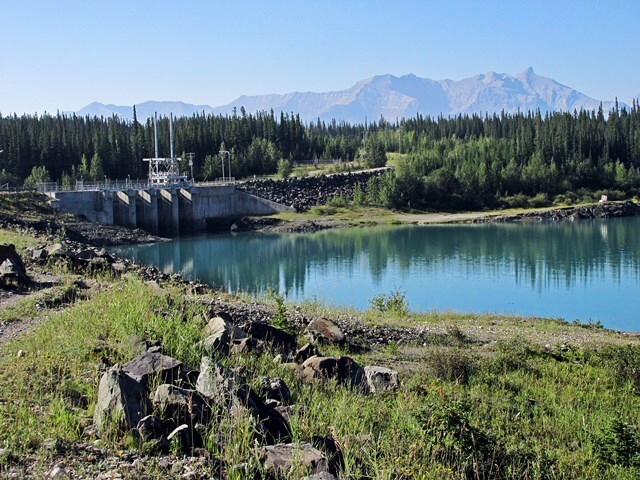 Bighorn Dam holds Abraham Lake in Bighorn Backcountry, Alberta, Canada. Bighorn Dam creates the incredibly beautiful Abraham Lake along the North Saskatchewan River on the 93 KM (58 mile) section of the David Thompson Highway (Hwy 11) through Bighorn Backcountry between Saskatchewan Crossing and Nordegg, Alberta, Canada. 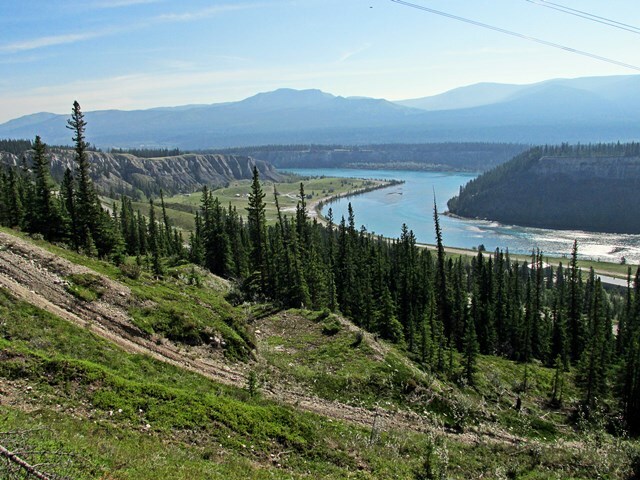 The clearly-signed entrance to the Bighorn Dam Hydro Generation Plant and recreation area is north of Tershishner Creek and a bit south of the entrance into the Crescent Falls Provincial Recreation Area where the previous hike occurred in early morning on this gorgeous August day. 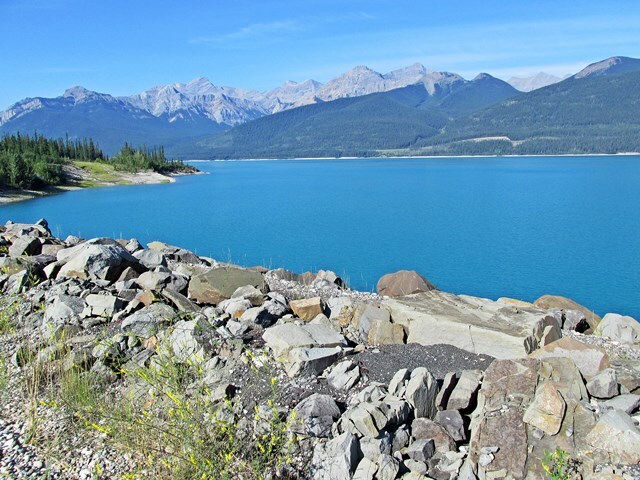 Following the reasonably short approach on gravel road, the first sign of the Bighorn Dam is the spillway and the concrete penstock rising above the turquoise, still-water surface of Abraham Lake. 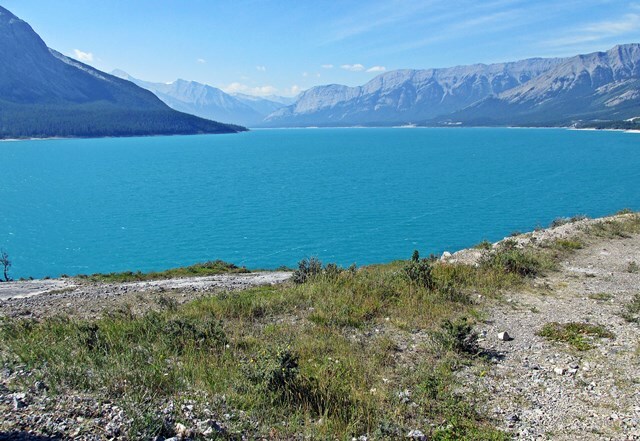 Abraham Lake is normally at a high level in late summer. 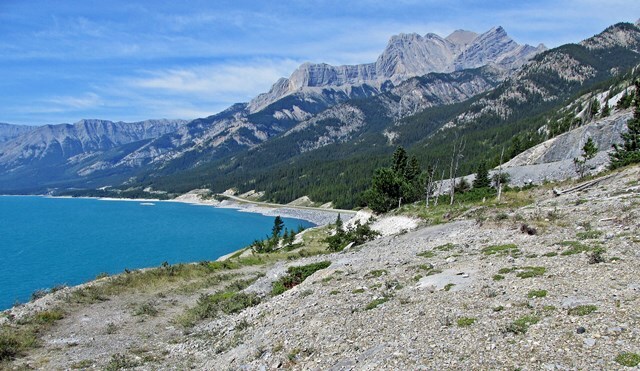 The 33 KM (20⅝ mile) long lake can vary by 40 meters (132 feet) in depth throughout the year. 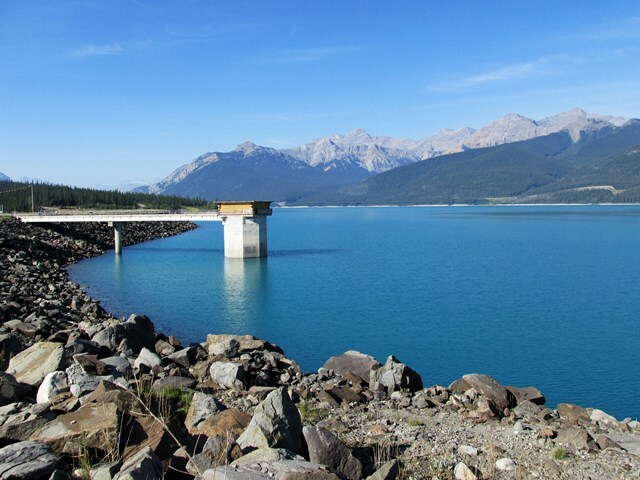 The 90 m (295 ft) tall, earth Bighorn Dam was completed in 1972. 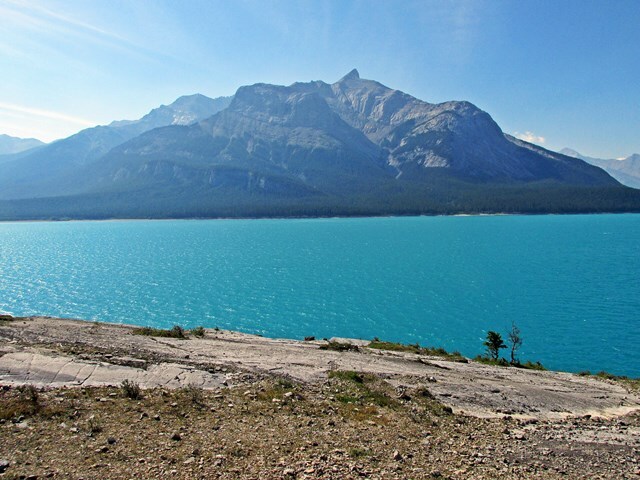 The glacial-fed, mountain-surrounded, turquoise lake is not suitable for swimming or boating because of large and sudden changes in wind and wave action, unstable shorelines and submerged rocks. Abraham Lake draws photographers from all over the world in winter. The attraction is columnar bubbles in the ice created by methane seeping from the lake's bottom. The surrealistic images are captivating and potentially explosive. 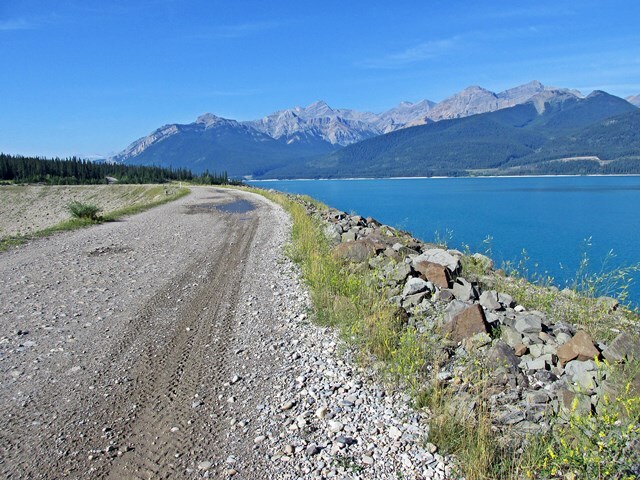 The gravel road from the top of the earth dam to the Bighorn Hydro Plant is deeply rutted and requires cautious negotiation. 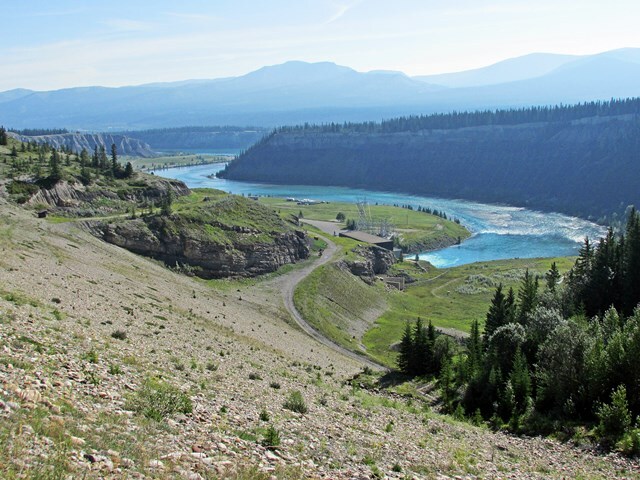 Several trailer and RV units, along with the occasional tent site, are enjoying the peaceful plateau above the shoreline of the North Saskatchewan River and beneath dramatic surrounding canyon walls. The sites are free but there are no services. 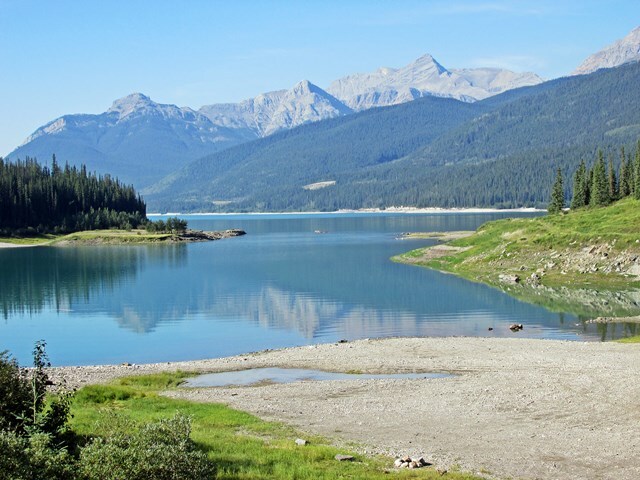 Following this visit to the Bighorn Dam the drive heads south on the David Thompson Highway for the next hike at Landside Lake. En route, an impromptu stop at unsigned, and appropriately-named, Windy Point is taken for magnificent views of turquoise water surrounded by towering mountains. 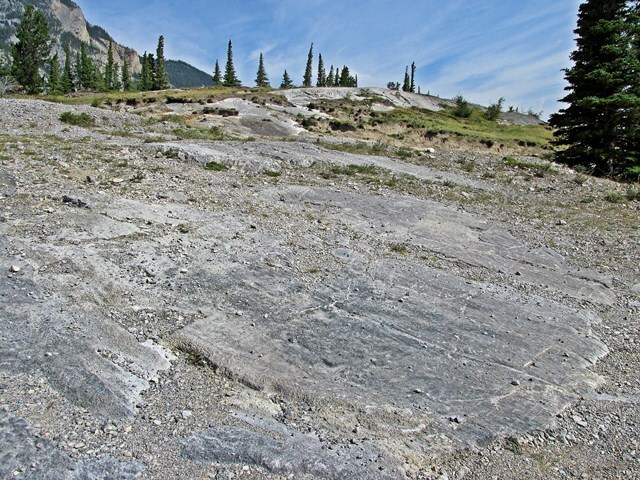 The polished rock at the parking area has been scraped smooth by glaciers retreating thousands of years ago. 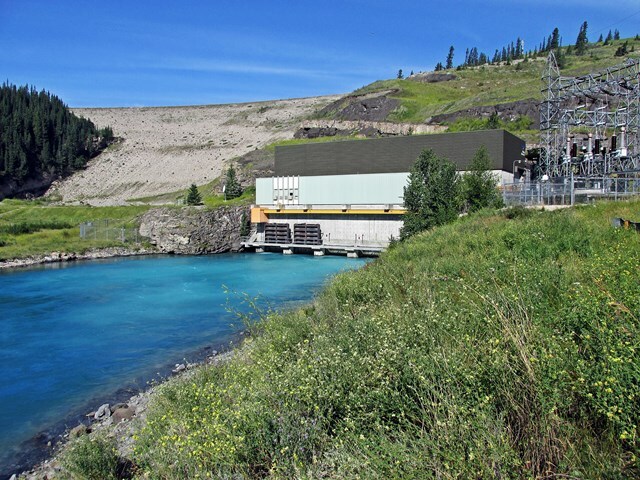 The hiking partner for this adventure was employed at the Bighorn Dam construction site as a millwright, circa 1971, charged with responsibility to assemble the two generators shipped in from Great Britain. The generators at Bighorn Dam resemble massive automobile alternators laid on their sides. This visit is also about nostalgic memories and wide-eyed discovery. 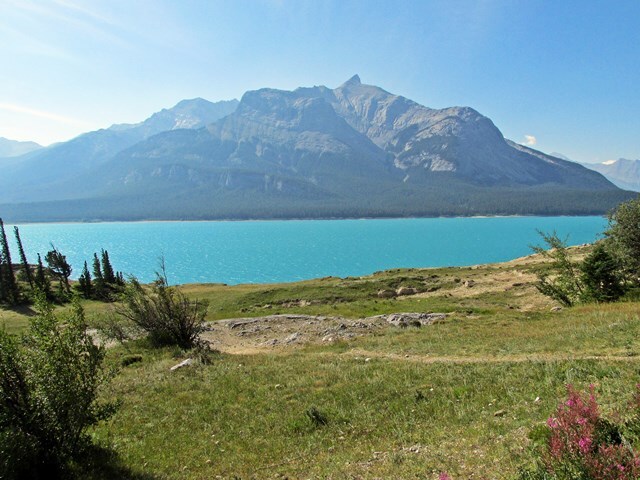 Photographs for this post were taken at Abraham Lake and Bighorn Dam in David Thompson Country between Saskatchewan Crossing and Nordegg, Alberta on August 18, 2014.